Rock music has proven to be a real hit when it’s combined with video games. It’s certainly had its’ fair share of bumps and bruises along the way (I’m looking at you Crue Ball) but the general consensus is that rock music and video games go very well together . We’re certainly seeing this more nowadays with the huge popularity of games like Guitar Hero and Rock Band. But back in the early nineties, this marriage of popular music and video games was still in its’ infancy so games like Rock ‘n’ Roll Racing probably seemed quite unique. 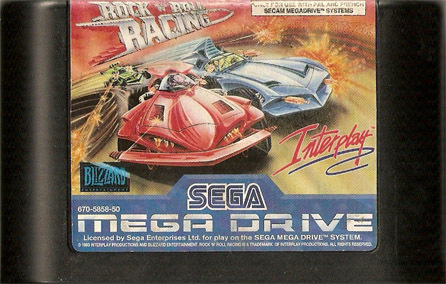 Developed by Blizzard Entertainment before they totally sold out to take the lives of many an RPG nerd, Rock ‘n’ Roll Racing simply combines the gameplay of an isometric racer with a rock attitude and soundtrack. The game allows you to race across a vast array of tracks on many different planets to take the number one spot and be crowned the king of interplanetary racing. The game kicks off with you picking a character and one of three initial cars to use and upgrade across the game. As you go to new planets, new cars will also be available to buy. Doing well in each race gives you money for new parts (and of course; cars) as well as score points. A certain number of score points are needed to allow you to progress to the next level. After each level you can obtain a password from the options menu allowing you to continue with your personalised car from that point. After 2 levels you will go to a new planet. The car customisation really stands out as a key factor in Rock ‘n’ Roll Racing. Not only can you upgrade your engine, tyres etc. but you are also allowed to upgrade your car’s weaponry. That’s right; Rock ‘n’ Roll Racing lets you play dirty. Missiles, hydraulic jumping, oil slicks and boosts are all at your disposal. Racing is as much about survival than it is winning. Thankfully, Rock ‘n’ Roll Racing is very responsive and simple to play. A 6 button pad certainly helps with the X, Y and Z buttons becoming your attacks. Cars control very well with drifting round corners being the most satisfying aspect of the driving. Unfortunately, the low angle makes judging some of the corners a little difficult but once you adjust to it you’ll soon have no problem. Graphically, the game is acceptable. Nothing special but certainly not at Master System level. The big issue is that each of the planets’ set of tracks seems to have a set colour theme which makes most of the game look repetitive. The first planet is largely red and black with the second being mostly purple. There really isn’t a lot of detail to the tracks at all. Sound is certainly a lot better and you’d hope it would be in a game that relies so heavily on its’ soundtrack. Ideally, it would have been nice to have had the real tunes which makes me wonder whether or not this would have been a better Mega-CD release. Either way, the chiptune versions of such classics like Paranoid and Born to be Wild are well composed and very quirky in their own way. The game also has a commentator which is something I’ve never seen in any other Mega Drive game. ‘Larry’ shouts out random quips at the carnage you play through and is generally easy to understand and amusing to listen to. After a while he does begin to grate a bit but luckily the game allows you to turn him off in the options menu. Other sound effects include screeching tyres, bumps and knocks as you hit walls and other characters as well as some decent explosions as cars are hit by different weapons. Rock ‘n’ Roll Racing is a fun little title that makes up for its’ unoriginal racing with heaps of weapon-based mayhem. Thanks to a great password system that saves all your car’s features, you’ll want to play through this game to the end to create the ultimate vehicular death machine. Also, the tunes are pretty cool.